Like I mentioned yesterday, I made a few little newborn fitted diapers to practice my diaper-sewing techniques. But after I got a few newborn diapers under my belt (even though none of them turned out perfect) I decided to dive right into into my real goal - a one-size waterproof diaper for Baby B! So I grabbed all my fancy supplies like PUL (the waterproof fabric) and snaps, and hoped for the best! The good news is by trying everything new at once I was able to find all my problems and mistakes in one fell swoop. Ha ha. :) This was my first attempt. 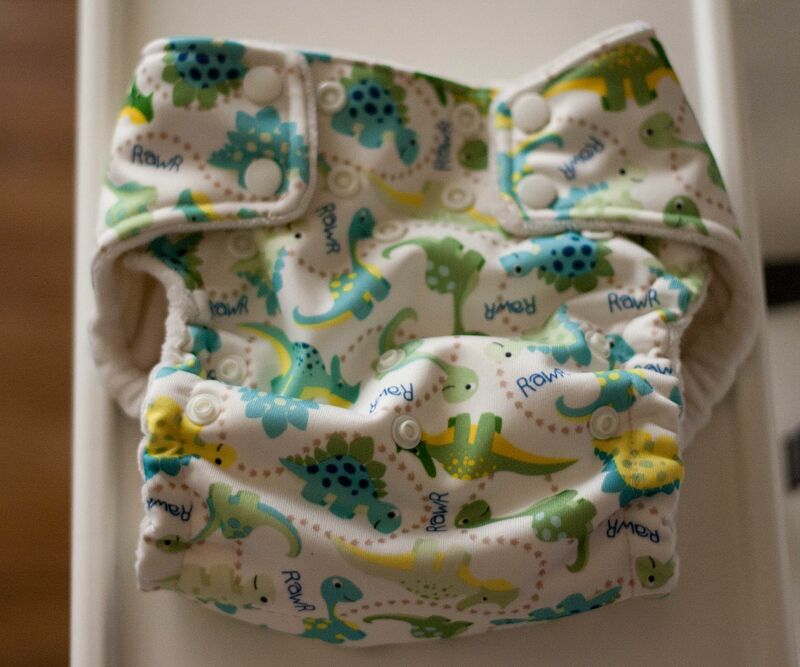 I based it on the Cloth Revolution size large pattern, but I modified the design to be front-snapping instead of side-snapping (just my personal preference) and added rise snaps to make it an adjustable one-size diaper (also my preference). The dinosaur PUL if from Hobby Lobby (with a 40% off coupon!) and the snaps are from kamsnaps.com. Now I just need someone to test it out....Oooh, a perfect candidate! As I finished sewing it, I thought it looked it wouldn't fit at all just because it was kind of different than my other diapers. But it actually fit surprisingly well! He's on the second rise setting, which is the same setting he uses on out other diapers so I think I got that sizing right on. He is only up one step on the waist, though, so I need to find a way to make that more adjustable for smaller sizes. But he has plenty of room to grow! I also may try making the whole thing a little narrower through the seat next time. It just seems a little wider than what we normally use. I found a few other things to try to improve on next time as well. For one thing, I think I'll have a better idea of how to keep my lines straight and neat with all these different fabrics, but I also plan to improve my elastic technique, add more snapping size options, and adjust the snap placement (they were WAY to close to the edge of the diaper in some places so I could hardly sew around them!). 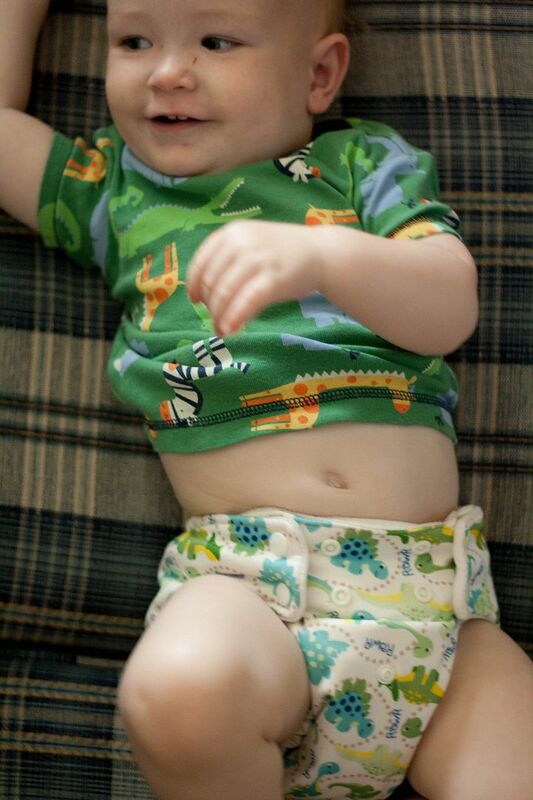 I used the PUL outer layer, a layer of hemp french terry, and a layer of organic bamboo velour to make the body of the diaper. So it has a fair amount of absorbency, but I think it needs a little more. 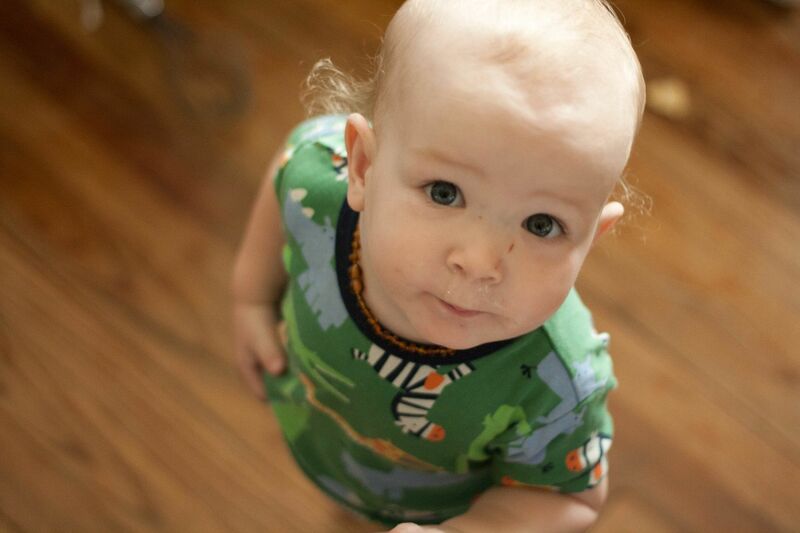 So far I've mostly used pocket diapers and I've liked them, but I recently won a Grovia diaper and my eyes were opened. The Grovia system has a sewn-in soaker (and an extra snap-in soaker if you need more absorbancy) so all the pieces stay attached in the washer. No more pocket-stuffing. 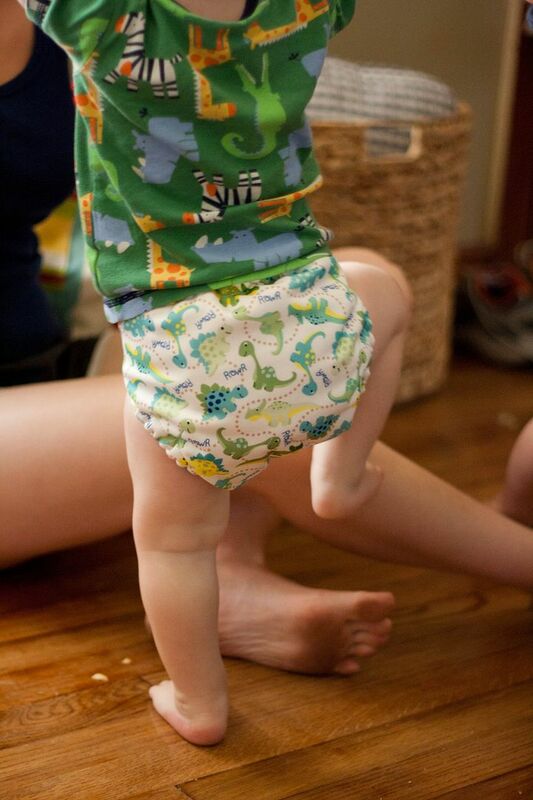 It is SO nice to pull that diaper out of the dryer and put it straight on! For now I'm just laying-in a bamboo insert from my pocket diapers, but I'm definitely planning to try the whole sewn-in-soaker thing! Love your model! And what a cute diaper! Wow! I feel so famous right now! :) Thank you so much for the kind comment. p.s. I just found out you guys are a family company - that is so cool!